Beautifully presented table linen makes all the difference and we believe it really adds the finishing touch. We pride ourselves that we have always supplied the highest standard quality of linen for hire, including tables cloths, table slips and napkins, as well as a top class, personal service. Our table linen is available in a wide range of colours to fit tables of all shapes and sizes. We also have an endless supply of classic white, elegant black or subtle soft ivory circular cloths to fit round tables from 4ft to 6ft in diameter. We offer an assortment of coloured napkins, chair sashes and covers and table runners all to coordinate and make your display beautiful. 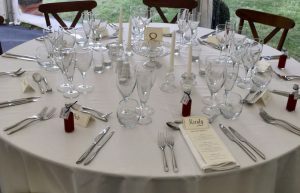 We work closely with our clients (caterers, corporate entertainers, marquee suppliers and often brides and even grooms!) offering advice to ensure that you achieve the look you want to create. 72" Round Table 60" Round Table 54" Round Table 48" Round Table 36" Round Table 72"x30" 72"x27"
Please Note: We have assumed all table tops to be 29″ high. 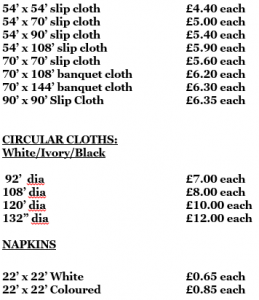 All prices are excluding vat or delivery and come in White, Cream and Black. Any other colour preference please call 01530 810 352.